Today we have something a little different - what I'm hoping is a new regular feature: a chance for some of my favorite kid-testers to interview one of their favorite authors. Natchez and Isla are both avid readers, entering 6th and 7th grade. They love a wide range of books, and one of their new favorites is Bruce Hale's Playing with Fire. Bruce Hale is a go-to author in my library for kids who love action blended with humor and mystery. My students love his Chet Gecko mystery series and his graphic novel-hybrid Underwhere series. This summer he's kicking off the new School for S.P.I.E.S. series with Playing with Fire. Natchez wonders what inspired you to write Playing with Fire. What made you want to write a book about an orphanage that taught kids how to become spies? Bruce Hale: PLAYING WITH FIRE represents the coming-together of several ideas and loves. First, ever since I was a kid, I've loved spy stories. James Bond, Get Smart, The Bourne Identity, Mission Impossible -- all these and more inspired me to want to write a spy story myself. Second, I had a yoga teacher in Hawaii who was like the ultimate drill sergeant -- crusty on the outside, but big-hearted underneath. She spoke in a kind of hybrid of Japanese and broken English, and she was such a character, I wanted to put her in a book someday. 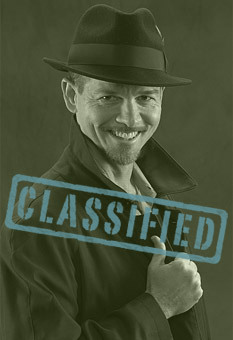 And third, I had an odd what-if thought: What if an orphanage was actually a covert school for spies? When all these influences came together, I hit upon the title "Shanghai Annie's School for Spies (and Merry Sunshine Orphanage)." For a long time, all I had was the title, but eventually I developed that germ of an idea into the book it is today, with my old yoga teacher in the Hantai Annie role. Isla is interested in why you made Max such a stubborn kid. She noticed that the book had lots of different emotions running through it and lots of different characters. Tell us about creating Max's character. Bruce Hale: It was difficult to find Max's character at first -- until I interviewed some people who work with foster kids, along with a former foster child. Then I started to understand some of the challenges these kids face and how it might affect their personality. For Max, I decided that the foster-family experience made him tough, stubborn, and sarcastic. The stubbornness would help him survive this strange situation he'd been thrust into, and the sarcasm would let me add some humor, which I always love to do. Writing this character was a fun challenge for me, as I'd mostly been doing light, funny books like Chet Gecko, without much emotional development in the characters. I'm curious whether you draw on any of your own childhood experiences when you are writing - whether things you went through, books you read or pop culture from when you were a kid. Bruce Hale: Most of my stories come from my imagination and some light research. But in this case, I based Max's relationship with his dad upon the one I had with my dad. We loved each other (he's passed on now), but we had a challenging relationship. Although I didn't use our exact situation, I did draw from the emotions of it. Also, as I've mentioned, I put my old yoga teacher into a supporting role as Hantai Annie. And of course, all my exposure to spy stories over the years helped shape the plot and give me ideas, like the villains' shark tank (from an old James Bond movie) and the kids crawling through the ducts (from every other spy and thriller movie). What books drew you to reading when you were a kid? How do you try to put elements of those in your writing today? Bruce Hale: I was a reluctant reader at first -- more interested in running around causing trouble than sitting still and reading. That all changed when I was in third grade, on a day my family still calls The Day The TV Died. My parents resisted getting a new TV for months, and instead, they read to my brother and me. The first series that really captured my imagination was Tarzan of the Apes, and I burned through that series and everything else by Edgar Rice Burroughs. From there I moved on to adventure books -- mostly classics like Ivanhoe, Robin Hood, and The Call of the Wild. And after that, I read voraciously in a wide range of genres. I think those adventure books helped define what I like (most of the time) in a good read: breathless action, tons of suspense, and situations that really challenge the main character. Today, I try to put some of those elements in nearly everything I write -- even the funny stuff. Isla is curious why you chose to set Playing with Fire in London. Bruce Hale: Even though I deliberately didn't mention any names of cities (to preserve that mysterious feeling), I felt from the beginning that the story would be set in London. Maybe it's because of all the British spy movies and TV shows I saw growing up. Somehow, with all the fog, the history, and so forth, London just feels more spy-like than, say, Pittsburgh. Finally, Natchez really wants to know if there's going to be a sequel to Playing with Fire! Bruce Hale: I just finished writing the sequel to PLAYING WITH FIRE. It's called THICKER THAN WATER, and it'll be out in Spring 2014. The third book, untitled as of yet, is just getting underway. I'll be working out the plot over the summer. Check out this video and a feel for Playing with Fire. Bruce Hale introduces is and then reading a sneak peak from the story. The review copy was kindly sent by the publishers, Disney / Hyperion. If you make a purchase using the Amazon links on this site, a small portion goes to Great Kid Books (at no cost to you!). Thank you for your support. 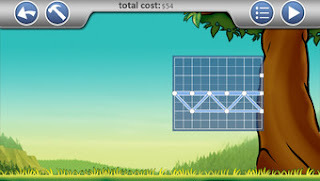 The kids at my school library have loved exploring new math and science apps. They love the ways that these apps build in game experiences to make learning FUN! I love how engaged the kids are with thinking, problem solving and learning key concepts and facts. One of our favorites has been SimplePhysics. It's hooked kids who love puzzles, experiments and building things. Check out the whole list of AASL's Best Apps for Teaching and Learning to find out about all of the science, technology, engineering and math apps that our panel recommends! 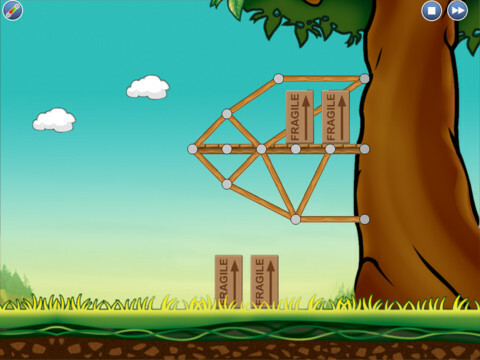 SimplePhysics lets you design complex structures for everything from tree houses to Ferris wheels. Verify the structural integrity of your design with a stress test. Great engineering is not enough, however - you have to keep your project under budget to win the game! Don't use too many resources, or you'll blow your budget. 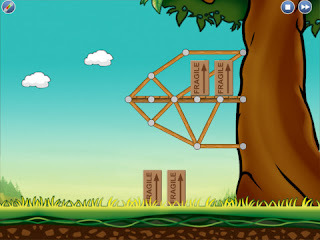 Here, you can see one of the first challenges: building a tree fort. The goal is to build a stable tree fort that will hold enough weight, with only using structures attached to the tree. After you build your structure, you get to test it with the four weights and see if it will hold them. 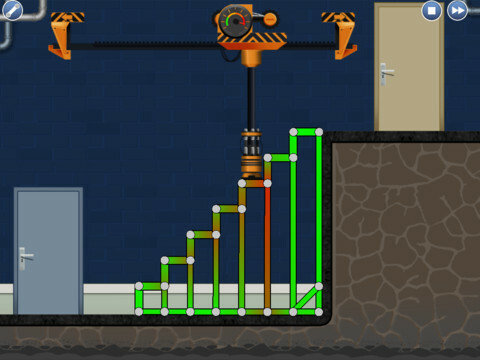 This allows kids to really see the results of their buildings, and see which joints are strong and which are weak. 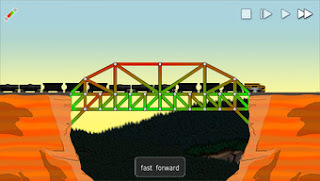 This is a more complicated challenge, requiring kids to build a bridge across a canyon. It has to hold the weight of the freight train. Kids love testing their creations and seeing the train crash to the bottom if their bridge isn't strong enough! 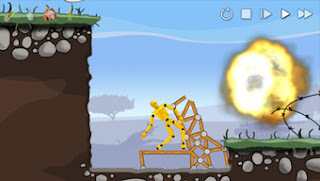 This is a screenshot when kids are testing the strength of their creation, in this case they are building stairs. The stairs must withstand enough weight and pressure. The app shows the load bearing of the different beams. And this might have been my students' favorite challenge. They had to build a structure that protected the dummy against an explosion. You can guess how much fun they had testing it! One of the things I liked best watching kids use this app is how much talking occurred as they were using it. Three kids would gather around the iPad and talk about what they were putting where, why it was working, which option they should choose. They could test out their theories and quickly adjust them. Head over to AASL's Best Apps for Teaching and Learning to discover more great apps for engaging kids with science, technology, engineering and math (STEM). The American Association of School Librarians is a wonderful professional organization to support school librarians in their work with students, teachers and parents. For the past year, I have been part of the task force to recommend the Best Apps for Teaching and Learning.This week I'd like to share our recommendations for 2013. This week, I will share a sampling of the apps we recommended. 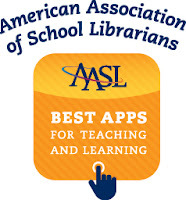 For the full list, please head over to the AASL Best Apps for Teaching and Learning website. Our committee selected five book apps to recommend, ranging from fun books for kindergartners to in-depth science books for high school students. 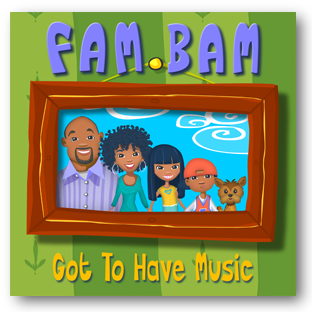 One of my favorites has been Fam Bam: Got to Have Music. Fam Bam is a playful, fun app that celebrates how important it is to respect everybody's own tastes. Featuring music and narration by rhythm-and-blues singer Brandy Norwood and her family, this app engages children with its playful tone, love of music and cartoon animation. Everyone in this family loves music, but each person has their own favorites and doesn't want to listen to the others' music. What's a tight-knit fam bam to do? The conflict resolves with a fun twist as everyone learns to compromise. Fam Bam has big kid appeal. They love all the different musical styles. The cartoon illustrations are upbeat and fun, and appeal to elementary school kids - they love the fact that it's narrated by the little dog! My students have enjoyed listening/reading it over and over, and yet I think it also holds an important message for all our kids. Work together to appreciate everybody's tastes and reach out to find a compromise that works. I especially like my colleague Sue Bartle's suggestion that a Fam Bam is any tight-knight community. We can talk about a family, a classroom, a group of friends as a fam bam. It would be fun to have a class create their own Fam Bam story about music, art, or books that they like. Have fun exploring these and the other apps that AASL recommended as the Best Apps for Teaching and Learning 2013.